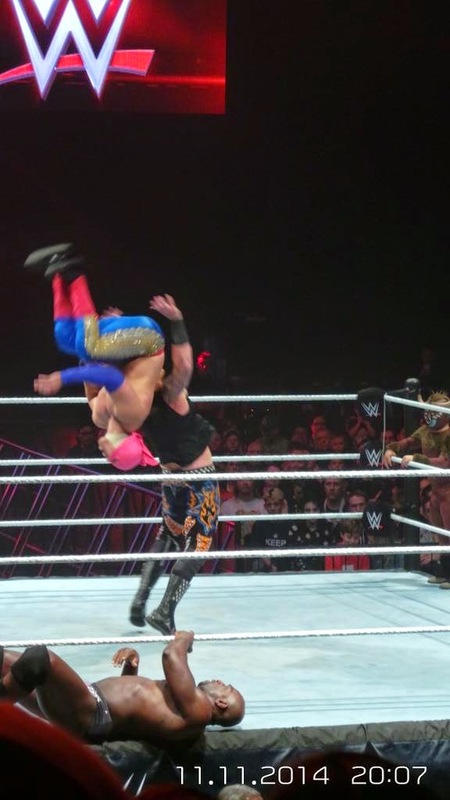 The night after RAW in Liverpool, WWE Live came to the Brighton Centre for the first time in around 25 years! For those who don't know, the Brighton Centre is a relatively small venue for a WWE event. Probably at the smallest end of the attendance-scale for a WWE house show. Still, these kind of smaller venues often create a decent atmosphere and the show was unsurprisingly a complete sell-out. Before I review the match card I would just like to confirm for those wondering; Yes, the word "Network" was taped over on the ring apron! The VT of Vince McMahon apologising for the UK Network delay was played out on the big screens and generally met with heat from the crowd, including a few "Where's our Network?" chants for good measure. First match was The Miz (w. Damien Mizdow) vs Sheamus. 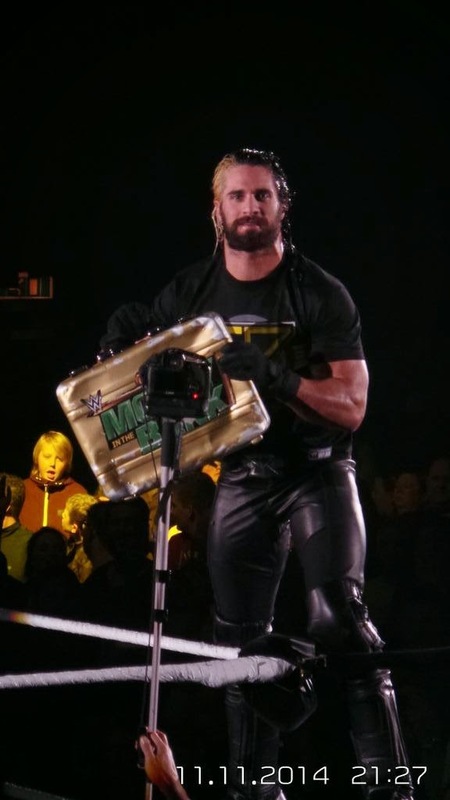 The Celtic Warrior got a great reception from the crowd - As did Mizdow! The Miz didn't enjoy such a warm reception, however. But he played up to it well and drew some decent heat from the crowd. 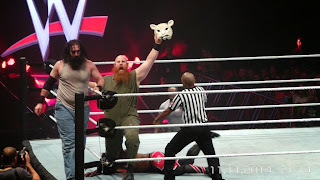 After a solid match to start the evening, Sheamus picked up the win with his trademark Brogue Kick. Second match on the card was Jack Swagger (w. Zeb Coulter) vs Curtis Axel. Swagger recieved a decent pop from the crowd when his music hit and the trademark "We The People" salute remains as popular as ever. The same can be said for Zeb Coulter, who enjoyed the crowd chanting his name throughout. Swagger picked up the win with the Patriot lock. Bringing an end to probably the least inspiring match on the card. The next match is usually the one I fast-forward on the remote when watching RAW or Smackdown - Los Matadores & El Torito vs Slater Gator & Hornswoggle. Obviously I didnt have the option to fast-forward the match this time around and in fairness, it turned out to be a fairly entertaining match. Having the opportunity to see high-flyers perform in the flesh is always very exciting and Matadores & Torito did a great job. The acrobatic babyfaces duly gained the spoils and I gained a lot more respect for what they do, having watched them live in person - Maybe I won't press fast-forward in future, after all? Now it was back to the serious stuff - Rusev (w. Lana) vs The Big Show, for the US title. First things first. You only truly realise how big the Big Show really is, when you are a just a few metres away from him. Rusev isn't a small guy, but The Big Show completely dwarves him! This was one of the weakest matches on the card, not helped by the fact we all knew the title was never going to change hands on a lowly house show. The Big Show DID win the match, but only via DQ after Rusev clobbered him with a chair shot - thus retaining his title. With Show down on the mat, Rusev and Lana made their way up the ramp as the World's Strongest Man, Mark Henry made his way down it and towards the ring. Some of the crowd began to cheer him, hoping that he was making his way to ringside to help the giant. 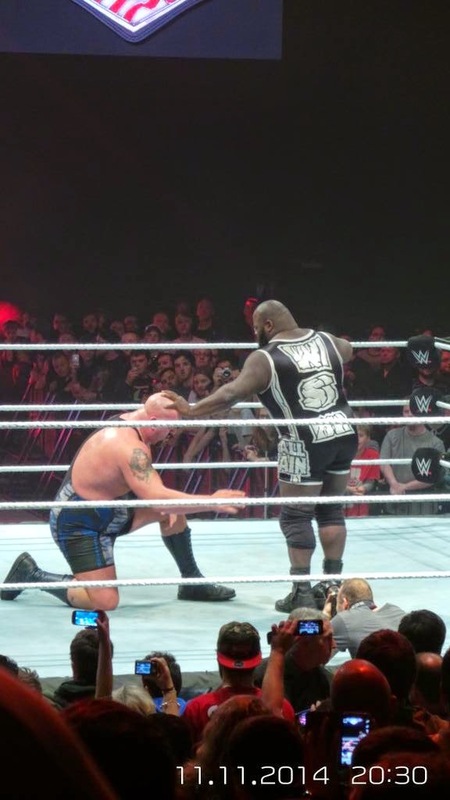 But anyone who watches the WWE product regularly, knew he was going to take a cheap shot at Big Show. Henry's joy was short lived however, as Show eventually made it to his feet and landed a knockout punch on Henry before making his way out of the arena. There was a 15 minute interval at this point, followed by some Divas action - AJ Lee vs Paige & Nikki Bella (w. Brie Bella). Initially, this was a tag team match, with Brie scheduled to team up with AJ. Then Nikki reminded Brie (and everyone else) that she is still under her command and that Brie wouldn't be competing in the match. By default then, this became a handicap match. Paige got a great reception as you would expect here in the UK. But she didn't get much action in the ring as Nikki deliberately stole the limelight. Paige's family were at ringside, so she just spent most of the time chatting to them instead! Meanwhile, Brie was working the crowd (and stealing her injured husbands trademark) by using the "Yes!" chant repeatedly. Nikki was distracted by this and also by an argument with her own tag partner, Paige. So much so in fact, that AJ snuck-up on her and rolled her up for the 1-2-3. The match was decent and entertaining enough. However it was a real shame we only got to see Paige work for a few minutes in the ring. The penultimate match on the card was surprising in a few ways; Luke Harper & Erick Rowan vs Xavier Woods & Kofi Kingston (w. Big E). 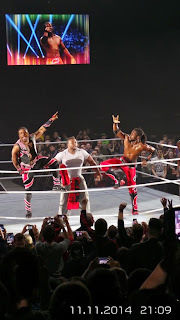 Surprising that Woods & Kingston are a tag team, but seemingly only on house shows. And even more surprisingly, they won! 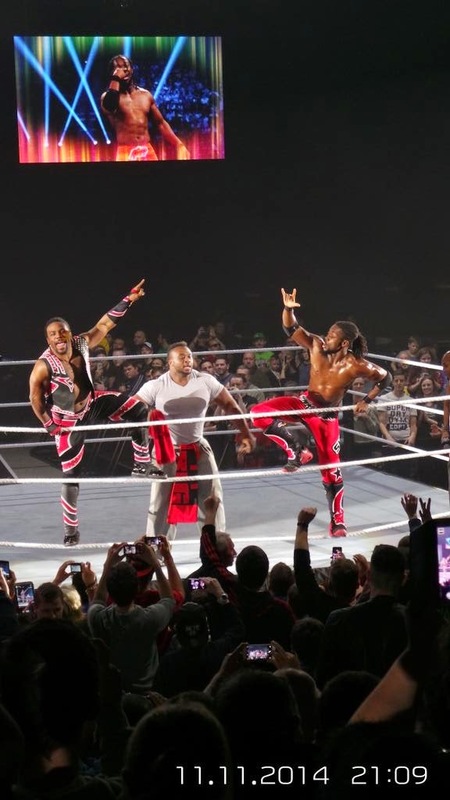 For me, they were two of the stand-out performers on the night and I really hope WWE give them some actual TV time as a tag team. They look great together in matching red ring attire. But more importantly, they work really well together as a team. After all - isn't that what tag teams should be about? 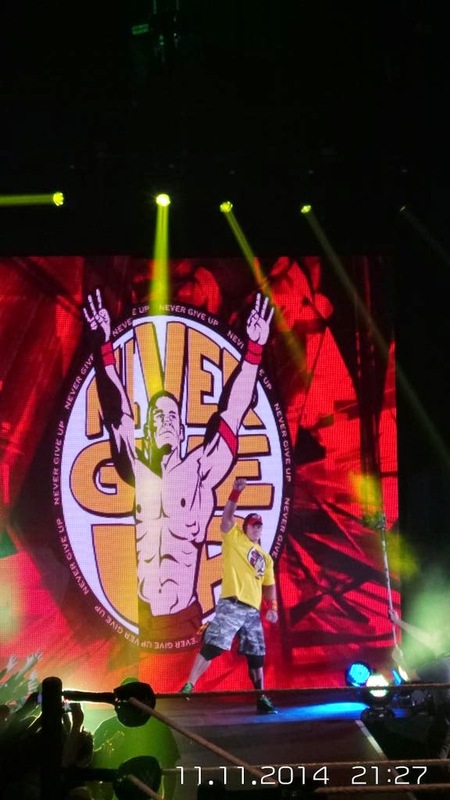 The main event of the evening was John Cena vs Seth Rollins in a Street Fight. This is a match that is strong enough to be right at the very top of a PPV card, let alone on a small house show and they duly stole the show in an epic 20 minute main event. 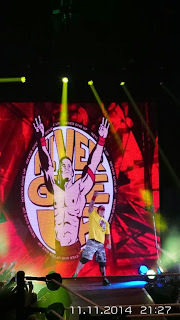 Love him or hate him; When Cena's music hit - The roof came off the Brighton Centre. For those wondering if Cena still has still got it...He has. 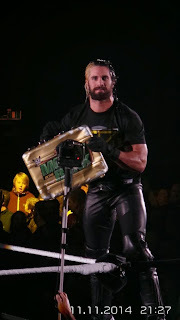 Rollins drew great heat from the crowd as expected. 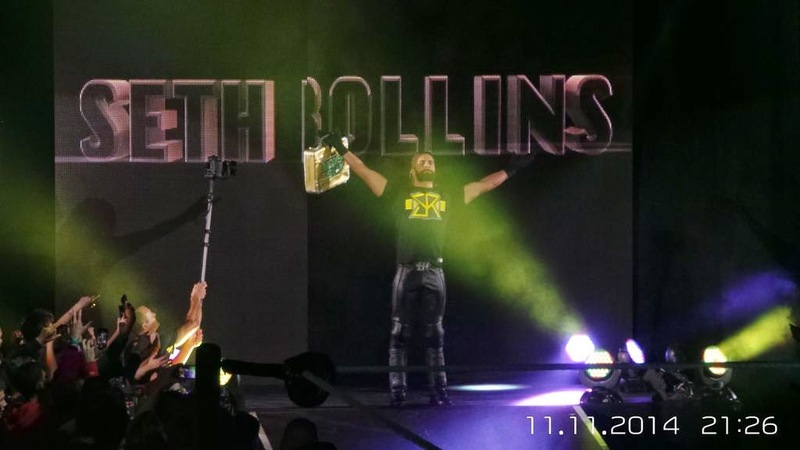 When WWE allow him to position himself as the "future" of the WWE - They genuinely mean it. In typical street fight fashion, an assortment of weapons were used by both men. These included chairs, stairs, a microphone and TWO tables! The second of these tables signalled the end for Rollins, as Cena AA'd him through it from the second turnbuckle. A WWE house show is a brilliant night of entertainment and a chance to see some of the biggest Superstars on the roster live in person. I would go as far as to say, most of the matches were better than on the episode of RAW the previous night. It's also nice to see the Superstars a bit more relaxed than usual, without the pressure of being televised around the globe. Well done to WWE for bringing wrestling back to Brighton after 25 years. But please, don't leave it so long next time! John Cena to turn heel at Survivor Series?